Make it a Labor Day of love! Send summer off with one more BBQ. 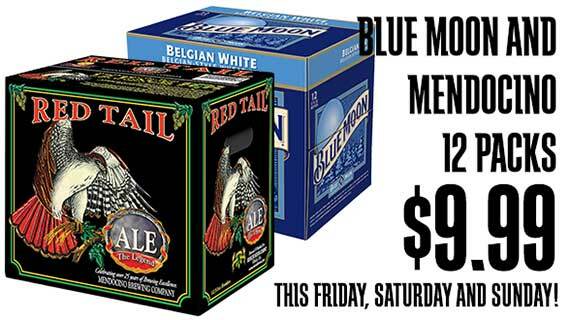 This Friday, Saturday and Sunday Blue Moon and Mendocino 12 packs are just $9.99. Just in time for your Labor Day celebration! Here’s a healthier, no-carb version of an all-time American favorite! 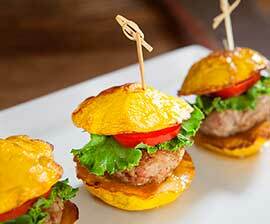 Instead of a bun, these sliders use sunburst squash making for a beautiful and tasty way to enjoy mini hamburgers without any guilt. Plus, they’re pretty adorable. 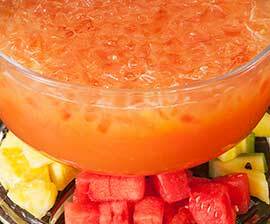 Add the perfect punch to your Labor Day celebration with these two variations on a fruity favorite. Plus, we’ve got delicious CA-grown jumbo Keitt mangos on sale at 2 for $5 and CA-grown seedless watermelon for just $3.99 ea. New Mexico’s Hatch Valley produces one of the most uniquely flavored chiles around: the appropriately named Hatch chili. Chefs agree that the valley’s intense sunlight and cool nights contribute to the Hatch’s delicious meaty flesh and mild-medium heat, making it the perfect choice for chile con queso, chile rellenos, and chile verde. *And you don’t have to stop there – try roasting and adding to salads, soups, stews, dips and sandwiches. Place chiles directly on the flame of your stove top and char for 6-8 minutes or until the skin turns completely black and blisters. When black and blistered, place chiles in a metal work bowl and cover with plastic wrap for 10 minutes to steam. Put on rubber gloves (chiles can burn! ), remove chiles from the bowl, and rub gently under cold water to remove the skins. (To freeze, remove the stems, membranes, and seeds and freeze in airtight containers or bags. Don’t overcrowd the bags/containers and freeze chiles within 24 hours after packing. Store packages flat in the freezer). Calling all summer grillers—it’s time to Rub with Love! 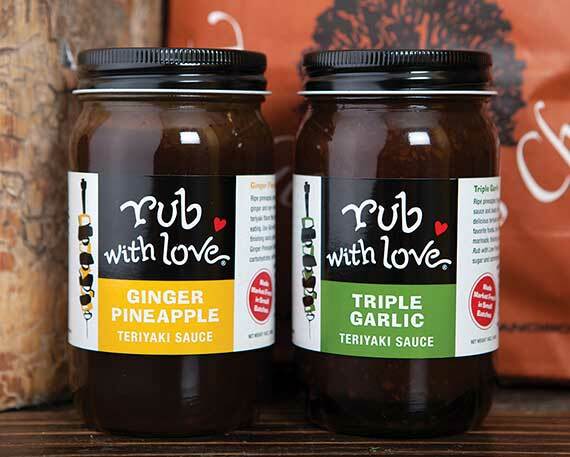 Seattle restaurateurs and creators of Rub with Love are inspiring us this summer with their sauces and rubs. Loaded with ripe pineapple, fresh ginger, toasted sesame, soy sauce and garlic, their Ginger Pineapple Teriyaki sauce is seasoning our shrimp and chicken skewers! Try using Rub with Love’s Salmon Rub when cooking for the salmon lover in your life—it’s an unbelievable combination of paprika, thyme and brown sugar. Warm weather and sun bring outdoor fun, like camping and the great American barbecue! Stop by our delis and see what we’ve got on the grill for you. If chicken’s your thing, then you’ve come to the right place: barbecue chicken is ready and waiting in halves, quarters or boneless breasts. 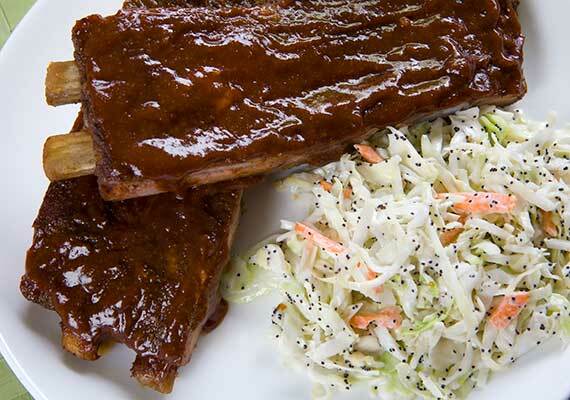 Or try Kyle’s BBQ Ribs or our Thai BBQ Salmon —they’ll have you smacking your lips and licking your fingers. In a supporting role, our Broccoli Coleslaw heads up the pack with a fresh and tasty take on an old–time favorite, or try our classic slaw for a more traditional option. We’re also grilling up corn on the cob and serving it as is, as well as using it in some of our favorite recipes, like Sonoran Corn Salad and Grilled Corn Succotash. While the grill is still hot, we’ll be grilling up some garden veggies as well. Finally, no barbecue is complete without potato salad, macaroni salad and egg salad, and boy, do we have a variety to choose from, like our Meadow View Macaroni. 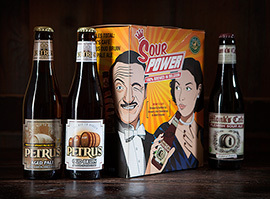 In the vast world of craft beers, sour beers are some of the most interesting and diverse. Known for their tart and sour taste, some styles can actually be fruity and slightly sweet. What’s a sour beer? Most breweries must keep a very sterile environment to prevent wild yeast strains from entering their beer. Sour-beer brewers, on the other hand, allow these wild yeast strains to enter the beer, creating the tart taste. Some brewers add fruit, such as cherries or raspberries, while the beer ages. 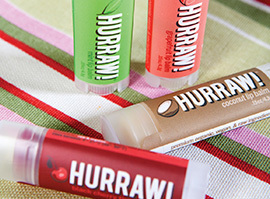 $3.99 each, Single Count Tube. Experience one of our Friday night tasting events! They’re happening at the following Nugget Markets from 5 p.m. – 7 p.m. and flights cost just $5. Attendees must be at least 21 years of age. The 9th Annual Spotlight Elk Grove wine and food event is a fun-filled evening of great food and drink all under one roof. This popular community event is hosted by the Elk Grove Regional Scholarship Foundation, and proceeds help provide scholarships in the local area. Be sure to stop by the Nugget Markets tasting table for outrageous goodies from our kitchens and other departments. elkgroversf.org. In celebration of our region's Farm to Fork week, the Yolo County Visitors Bureau is offering a series of farm tours designed to educate the community in a fun and engaging way. Enjoy tours and tastings at Fiddler’s Green Farm, the Yocha De He Olive Mill, and the farm at Capay Organic. Local wine and a sunset dinner will be served. $50, dinner included. For more details and information on other tours in the series, contact the Yolo County Visitors Bureau office (530) 297-1900. Prices valid August 28 - September 3, 2013.